"​The author skillfully builds a suspenseful mystery, cautiously meting out just enough information to keep readers gripped by the plot, but not so much that the conclusion becomes transparently obvious. In addition, her prose can be elegant: “In some way, this sealed display made it seem that Mr. McGee’s death was all for show. Even Christ’s body hadn’t been left hanging so long as a lesson to his people before he’d been decently interred.” But the novel’s strongest selling point is its artful amalgam of historical scholarship and fictional drama—Shortell brings her meticulous research to vivid life. A thrilling and historically edifying period tale." "​Those who think Canadian history lacks drama will find, in Celtic Knot, a suspense-filled fictional tale that chronicles the impact of a singular event at a turning point in a young nation’s development. It is a confident, meticulously researched, and superbly written tale. Shortell perfectly captures the language and atmosphere and ethos surrounding those momentous times.[...] It is a tale that will not only appeal to students of history, but to anyone in search of a well-told, gripping tale of murder and its aftermath." "ANN SHORTELL came into the bookstore about a month ago and dropped off a copy of her first mystery titled Celtic Knot. I’ve been meaning to get to it for a while now as I had heard her talk about her book, its plot and characters and it sounded all so intriguing. It had also been shortlisted for the Arthur Ellis award for the best unpublished manuscript, The Unhanged as it’s called. Finally got to it, and, well, so far so good. I’m at the cottage, it’s wet and miserable so what better than to curl up with a good book and read? Although summer is not quite officially here it had been really hot and humid when I arrived, but it turned so cold and damp that I started the fire. Pixie was quite pleased about that. The story takes place around the time of Confederation and deals with the assassination of Thomas D’Arcy McGee, one of the greatest murder mysteries in Canadian political history... It all makes for a lively, entertaining story." 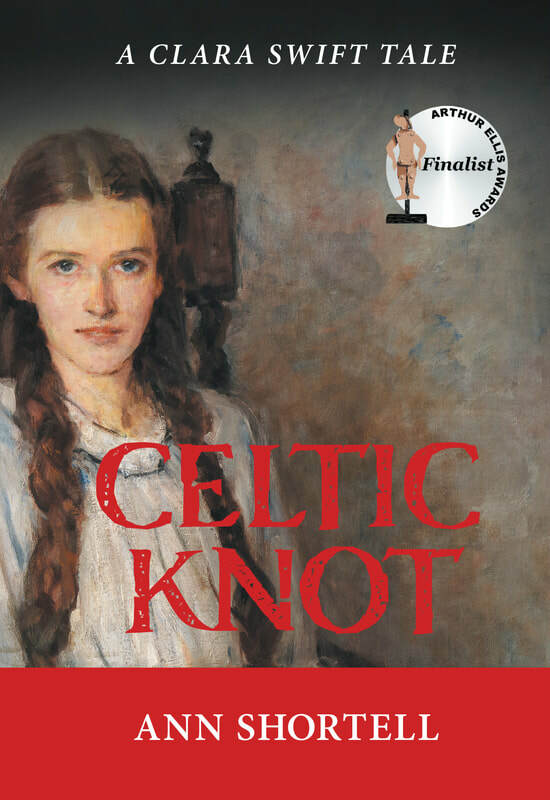 "Ann Shortell’s Celtic Knot examines history through a young Irish teen as she grapples with a mystery, assassination, and political intrigue.. . . Clara Swift, who thinks the world of her slain employer, sets down a path to discover an explanation for his murder. As Clara becomes swept up in the investigation, the trial, and the eventual hanging of an Irish immigrant, she records it all in her diary.. . Her actions offer a unique view of the somewhat debated conspiracy behind McGee’s murder. The decision to frame the story through a fifteen-year-old housemaid adds a dramatic touch while retaining the unusual nature of the crime and its aftermath. Clara is a fascinating character. . . While she is intelligent and determined, she’s still young and inexperienced. She idolizes McGee and frequently recalls his words and her experiences with him. She leads his story through all its highs and lows with her own flair and determination. . . his actions and thoughts resonate and drive her forward . . .Polished prose captures the tones and styles of the late 1800s perfectly. . . Since the narrative is entirely Clara’s, the ambiguity creates compelling interest . . . a secondary mystery simmers beneath the surface. McGee’s latest manuscript is missing and all signs point to theft. . Clara’s loyalty to McGee drives her to discover the fate of the manuscript, one with important political ramifications. Celtic Knot is unusual and engrossing historical fiction that winds plausible mystery elements into an ode to a treasured national hero." "I read this book and loved it from beginning to end. Who would know that Candian history could be so intriguing!? The assasination of Darcy McGee was a shocking event in 1868 and this book creates an authentic feel for the way people experienced it. The mystery takes in the history of the Fenians and weaves in the personalities of key political figures of the time. You will meet Canada’s first Prime Minister! It is also a “who dunnit “ and young Clara is an enjoyable clever protagonist. A very enjoyable read. I hope to hear more tales from Clara Swift in the future!"